Ehpro Panther RDA Tank, which is designed for flavoe and cloud chaser, adopts bottom and top airflow slots for pure flavor. Gold-plated build deck ensures excellent electrical conductive performance for stable output. Ehpro Panther RDA Tank, which is designed for flavor and cloud chaser, adopts bottom and top airflow slots for pure flavor. Gold-plated build deck ensures excellent electrical conductive performance for stable output.Here are standard pin and squonk pin for choice. There are 4 colors in BB. Just take it as your spare part. • No liquid, you need to but it separately. Let’s talk about cheap gear. And I’m not talking cheap in general, I’m talking about cheap even in the realm of Chinese aesthetics. There’s a few brands that specialize in dirt cheap gear and Ehpro is one of them. Originally known for the Billow and the Bachelor, they’ve expanded into different places. Today, we look at the Panther RDA, a dual coil RDA. 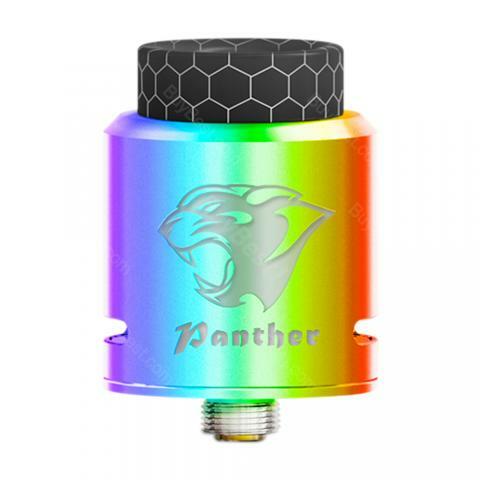 See more Ehpro Panther RDA Tank review. Ehpro Panther RDA Tank is an exquisite and trendy dripping atomizer with 24mm diameter. Available in various colors. Made of stainless steel. Great atomizer, golden is beautiful and costs little. Such which to the description, very fast.